We had our best conference yet February 21-22 in Dallas. We had more than 90 participants despite widespread flight cancellations and delays due to terrible weather. The energy level, sharing, and participation more than made up for the weather. Roy Pollock, co-author of The Six Disciplines of Breakthrough Learning, was our first keynoter and really set the tone for the conference by reminding people that learning must be connected to the business. Our panel session before lunch gave Kimo Kippen, Adri Morales, Terrence Donahue, and Peggy Parskey an opportunity to share their thoughts on the greatest opportunities ahead of us. All agreed we live in a very exciting time for L&D and that advances in technology and learning platforms will allow us to reach more people in more impactful ways than ever before. Adri Morales, 2016 CLO of the Year, then stayed on the stage to share her personal journey and thoughts with the group. The afternoon of Day One offered six more breakout sessions for a total of nine the first day. Predictive analytics, measuring informal learning, ROI Goal Setting, xAPI, spending levels, and the application of the 6D’s at Emerson were just a few of the topics that generated a lot of interest. 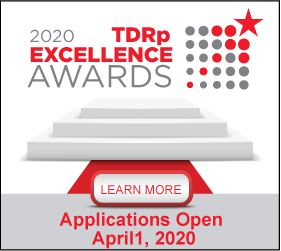 Participants came back together late in the afternoon to learn about a new maturity model for learning developed by Peggy Parskey, Cushing Anderson and Kevin Yates which was in turn used to help judge the First Annual TDRp Excellence Awards. The 2018 winner was USAA. We closed out Day One by having speakers meet with participants in the café for wine and lots of good discussion. Day Two began with a keynote by Marianne Parry and Lee Webster on the brand new ISO standards for human capital reporting. The audience was very interested to hear about the recommended measures and next steps in the process to adopt these. More breakout sessions followed to engage participants on measurement strategy, isolating impact, level 3 design, alignment and the future of the corporate university. Leaders from Humana, Siemens and USAA also shared their measurement strategies and journeys. We wrapped up with a panel hosted by Patti Phillips to learn what Lorrie Lykins, Paul Leone and John Mattox saw for the future of measurement. Much like Wednesday’s panel, the group predicted a bright future for measurement enabled by technology, xAPI, and advances in the field, especially in predictive analytics. Everyone left feeling recharged and excited after a day and a half of great speakers and provocative, informative sessions. And it just feels good to be around like-minded people who understand your challenges and who all want to improve. Planning for next year’s conference is already underway. It will be February 20-21 in Dallas at the same venue. Patti Phillips, CEO of the ROI Institute, and Jeff Higgins, CEO of the Human Capital Management Institute (HCMI) will keynote and Lee Webster will return to give us an update on the ISO standards for human capital reporting. CTR is poised to help drive an ISO effort to establish TDRp as the framework for the types of measures and reports for our field so we will have an update on that as well. Hope to see you in Dallas in 2019!